Metal fans, listen up!! 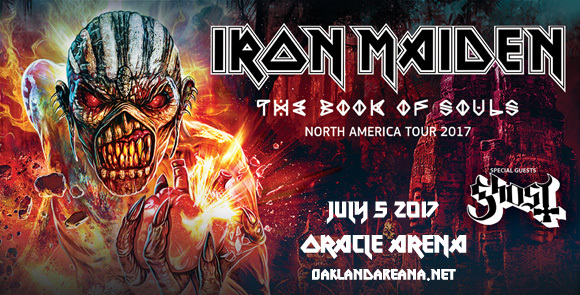 By popular demmand Iron Maiden are expanding their hugely successful European “Book Of Souls,” tour to a second run around North America!! With support from Ghost, they will headline the Oracle Arena on Wednesday 5th July 2017. Featuring complex stage sets, dazzling sound and light effects and of course the appearance of their mascot Eddie, Iron Maiden promise a show you CANNOT afford to miss!! Tickets won’t last long – get yours NOW while you still have the chance!! Formed in London 1975 by bassist Steve Harris, Iron Maiden are one of the most influential and prolific heavy metal bands in the history of the genre!! Their discography is compiled of an incredible thirty-eight albums, with sixteen studio albums, eleven live albums, four EPs, and seven compilations!!! Achieving their first major successes in the early 80s, with several albums that went on to become gold and platinum certified, including “The Number Of The Beast,” “Piece Of Mind,” and “Powerslave”. Opening for Iron Maiden are Ghost, the Swedish doom metal band formed in 2008. Known for their immediately identifiable yet enigmatic onstage appearance, almost all of the band members wear identical costumes that conceal their faces, with the vocalist, who goes by the pseudonym Papa Emeritus, wearing skull-type face paint in a the style of a demonic Pope. The band members keep their true identities completely secret. Their first full-length album, Opus Eponymous, was nominated for a Grammi (Swedish major music award), helping the band to gain mainstream recognition and widespread critical acclaim.